"I got this great dish from my Mother, who in turn got it from my Grandmother. This is a staple in our family throughout the year and especially on holidays. My Mother comes from a small town in Mississippi and all of her sisters make this dish the same way. Enjoy this Southern-styled twist on macaroni and cheese." Preheat oven to 350 degrees F (175 degrees C). Grease a 2 1/2-quart casserole dish. Set cheese packet from mix aside. Bring a pot of lightly salted water to a boil. Cook elbow macaroni in the boiling water, stirring occasionally, until cooked firm to the bite, 5 minutes. Drain and reserve pasta cooking water. Whisk contents of reserved cheese packet with evaporated milk, eggs, salt, and pepper in a bowl. Layer half the cooked macaroni in the prepared casserole dish, followed by half the Cheddar cheese slices in a layer. Dot with half the butter. Repeat layers, using remaining half of cooked macaroni, remaining Cheddar cheese slices, and remaining butter. Pour evaporated milk mixture over casserole. If evaporated milk mixture does not reach to the top of the casserole, pour in enough pasta cooking water to cover. Make rich, creamy macaroni and cheese on the stovetop. 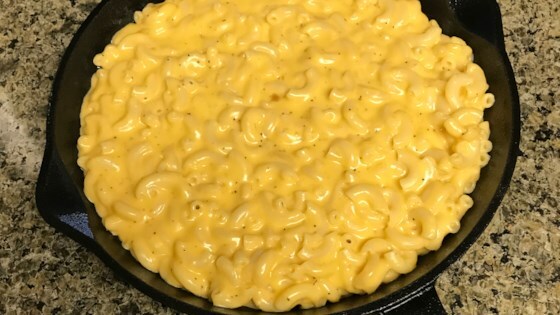 Sounds like a good midweek mac and cheese recipe but true southern mac and cheese recipes never begins with a processed cheese mix!! !